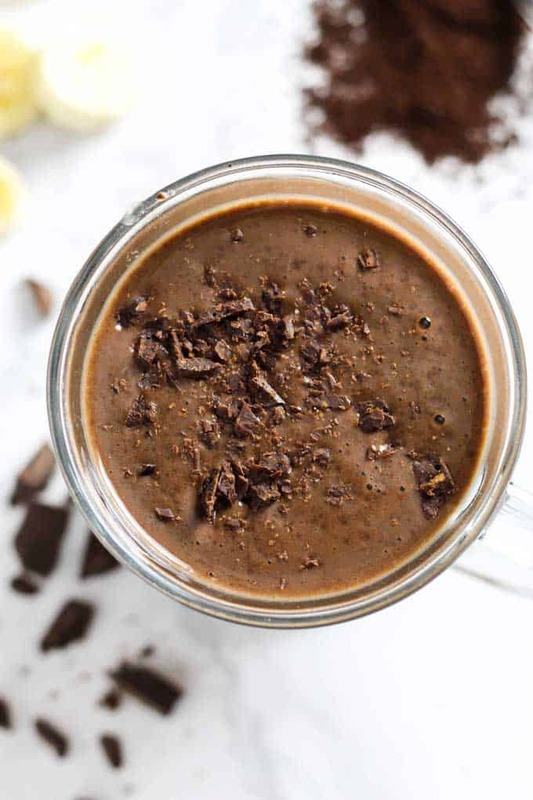 Healthy Chocolate Coffee Smoothie-packed with protein! When we moved to England last summer I had to be very picky about what small appliances I brought with me to use in the kitchen because of the difference in voltage. The Keurig went into storage along with my crockpot. (We bought inexpensive British Voltage replacements to use while we live here.) I did, however, bring my stand mixer and my Ninja blender-those two I just couldn’t live without. 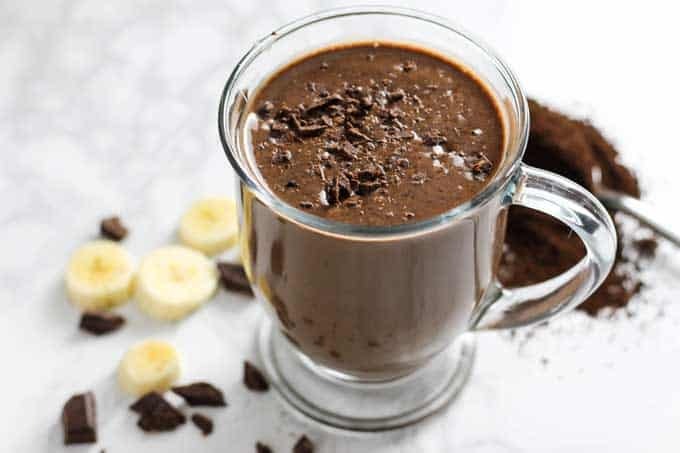 It’s pretty funny when I want to use them though, the only transformer I have is in the living room behind the TV stand, so you’ll find me almost daily with my little Ninja blender on the living room floor whipping up smoothies like this delicious Chocolate Coffee Smoothie I’m sharing today. Like a lot of us this time of year I’m trying sooooooo hard to eat better. All this yummy British pub food has taken a bit of a toll on my waistline unfortunately! But sometimes a girl needs chocolate, am I right? 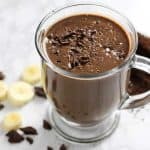 That’s why this smoothie is so delicious, it combines two of my favorite things-coffee and chocolate-in a healthy, protein packed package that satisfies sweet cravings while keeping you on track! Add all ingredients into a blender and blend until smooth. Add milk or water to thin if desired. 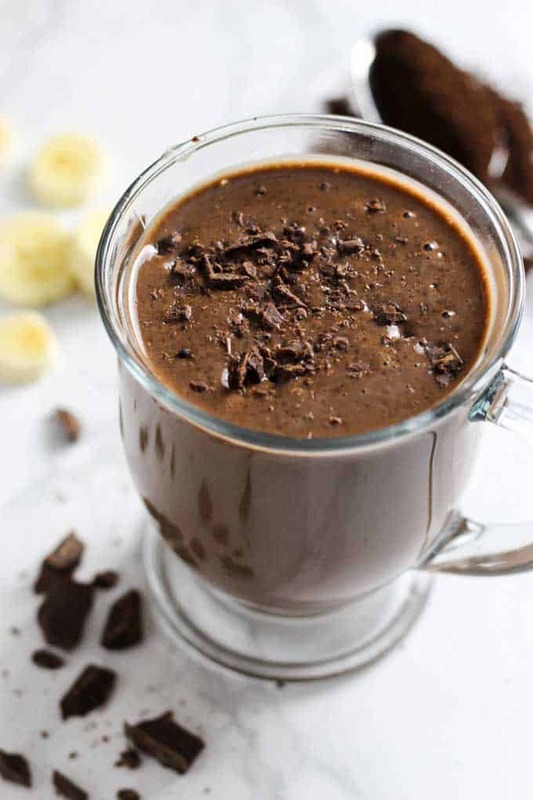 This healthy Chocolate Coffee Protein Smoothie tastes delicious but is actually good for you! My new favorite healthy treat! Yum, right?? This is a great way to use bananas up that are getting past ripeness-I peel and chop them up and keep them in a container in the freezer to quickly use in my smoothies. Let me know what you think in the comments-I love hearing your feedback. Melissa, it sounds as though you just might be missing your home in the United States. I know how that feels because although I was born in England (Exeter, Devon) and lived most of my life in America, I still miss England. Home has the feel of being “in place.” It’s not as though you aren’t making a home with family in England, it’s just different, and it will be a part of your fond memories when you leave. Thank you for the recipe for a healthy hot chocolate drink. We intend to make it and savor it! Hi there. Is this one serving or two? Any idea if calorie count! Thank you!! I see all this chocolate laying around and no mention chocolate in the recipe , except for the protein powder ?